Radiant heat is extremely energy efficient and can reduce your heating costs by up to 30% while lessening your impact on the environment. Adasak Mechanical is your number one choice for radiant heat and boiler systems in the Kamloops area. At Adasak, we are passionate about energy efficient solutions. We are proud to offer a one-stop-shop for construction projects and energy upgrades in the Kamloops area. Bring us your plans, and we’ll build a complete plumbing and heating system to suit your needs. Adasak specializes in quality radiant floor heating for both new and existing structures. For more traditional upgrades, we also offer conventional forced air options and furnace maintenance. We do high efficiency boiler systems, radiant floor heating, baseboard radiators, towel warmers, and other heat transfer products. The most common reason why people choose radiant heat is because it provides a more even, comfortable heat and eliminates noise as well as airborne allergens and dust. Radiant heat is also extremely energy efficient and can reduce your heating costs by up to 30% while lessening your impact on the environment. Simply put, radiant heat is the process of transferring heat energy to an object. An energy source creates heat, and that heat is transferred to nearby objects and structures through thermal radiation. Everyday examples of this include standing by a fire or enjoying the warmth of the sun. Unlike radiant heat, conventional forced air systems heat space through the distribution of heated air. With a radiant heat system, heat energy is emitted from a warm element, such as a floor, warming people and other objects in the room rather than heating the air. 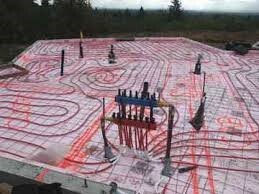 Adasak Mechanical specializes in hydronic radiant floor heating systems. These are systems in which plastic tubing is embedded throughout the concrete slab (or installed into existing floor joists), creating a looped tubing system. The tubing system is connected to a boiler with hot water. Hot water is then pumped through the subfloor, transferring heat to the floors and warming inside objects from the ground up.